Discover £700 Off Per Couple on December Asia Bookings at Marella Cruises - Includes Thailand! Thomson Cruises is now known as Marella Cruises — taken from the celtic word for ‘shining seas’, it continues to provide the tremendous service you’ve come to expect but under the new Tui banner, where all holidays are there to help you “discover your smile”. Promising you the friendliest service on the seas, Marella Cruises is ideal for couples, families or solo adventurers. Onboard facilities promise incredible dining with at least 3 high quality restaurants on board (the captain’s gala reception is a particular highlight), exciting live entertainment and all sorts activities including wine tasting, dance classes, cookery demos and much more. The Kids Club has plenty of things to do for 3-11 year olds, teens have sports to enjoy and there are lots of family friendly excursions on land. With all sorts of itineraries ranging from coastal highlights in the Canaries to sun chasing in East Asia and 80s Weekenders, there really is something for everyone, whether you’re up for dancing the night away or looking for a gentle escape. How do I use my Marella Cruises discount code? 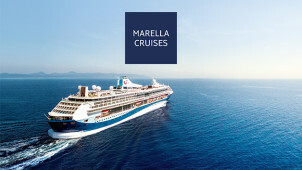 Sign up to Marella Cruises’ mailing list to hear about some brilliant offers! Where is my nearest Marella Cruises store? You can search for your nearest Tui store here. Are Marella Cruises suitable for those with access needs? Very much so. Give the customer welfare team a call before booking for advice on accessibility, bringing medical equipment and facilities. All ships have a cash free system, everything is charged to your cabin account. You can settle your bill in cash although you’ll be asked for a weekly deposit of up to £200. You’ll get an interim bill have way through your trip so you can keep track of your spending. Do I need a passport for Marella Cruises? Yes, every cruise listed requires a passport, without which you won’t be able to board the ship. You can return your purchase within blank days of receipt to receive an exchange or refund. Item must be in original conditions and packaging. Contact customer services and then send product back, including a covering note identifying reasons for return. Introducing Marella Cruises — Tui’s cruise branch, dedicated to giving you an amazing experience onboard its luxurious vessels. You’ll be served by the friendliest staff, enjoy fantastic food and entertainment, and get to see some incredible destinations, all for less when you book with a Marella Cruises discount code from vouchercloud. Whether you’ve never set sail before or are a cruise veteran, Marella Cruises promises the trip of a lifetime. Marella Cruises can whisk you around the world, taking in some of the most beautiful spots the planet has to offer and ensuring a great selection of routes all year round. You could discover the golden sands of the Caribbean, the vibrant culture of Central America, the majestic fjords of Scandinavia or historical riches in the Mediterranean. Plus, cruises sail at night so you’ll have more time to explore these shores during the day! We’d heartily recommend Marella Cruises’ Cruise & Stay option that’ll get you time on the boat and an extended stay in a handpicked hotel. You could enjoy a little longer in the Canaries, Barbados, Croatia and beyond and using a Marella Cruises voucher code from vouchercloud will get you an even better deal too. With a range of budget-friendly and more luxurious properties, it’s a perfect way to continue your cruise experience.